THE PRESIDENT: Thank you very much. I just wanted to begin by mentioning that the nominee for Secretary of the Department of Labor will be Mr. Alex Acosta. He has a law degree from Harvard Law School, was a great student. Former clerk for Justice Samuel Alito. And he has had a tremendous career. He's a member, and has been a member, of the National Labor Relations Board, and has been through Senate confirmation three times, confirmed -- did very, very well. And so Alex, I've wished him the best. We just spoke. And he's going to be -- I think he'll be a tremendous Secretary of Labor. And also, as you probably heard just a little while ago, Mick Mulvaney, former congressman, has just been approved -- weeks late, I have to say that. Weeks, weeks late. Office of Management and Budget. And he will be, I think, a fantastic addition. Paul Singer has just left. As you know, Paul was very much involved with the anti-Trump, or, as they say, "Never Trump." And Paul just left and he's given us his total support. And it's all about unification. We're unifying the party, and hopefully we're going to be able to unify the country. It's very important to me. I've been talking about that for a long time, but it's very, very important to me. So I want to thank Paul Singer for being here and for coming up to the office. He was a very strong opponent, and now he's a very strong ally. And I appreciate that. I think I'll say a few words, and then we'll take some questions. And I had this time -- we've been negotiating a lot of different transactions to save money on contracts that were terrible, including airplane contracts that were out of control and late and terrible. Just absolutely catastrophic in terms of what was happening. And we've done some really good work. We're very proud of that. And then right after that, you prepare yourselves and we'll do some questions -- unless you have no questions. That's always a possibility. I'm here today to update the American people on the incredible progress that has been made in the last four weeks since my inauguration. We have made incredible progress. I don’t think there's ever been a President elected who, in this short period of time, has done what we've done. A new Rasmussen poll, in fact -- because the people get it; much of the media doesn’t get it. They actually get it, but they don’t write it -- let's put it that way. But a new Rasmussen poll just came out just a very short while ago, and it has our approval rating at 55 percent and going up. The stock market has hit record numbers, as you know. And there has been a tremendous surge of optimism in the business world, which is -- to me means something much different than it used to. It used to mean, oh, that's good. Now it means that's good for jobs. Very different. Plants and factories are already starting to move back into the United States and big league -- Ford, General Motors, so many of them. I'm making this presentation directly to the American people with the media present, which is an honor to have you this morning, because many of our nation's reporters and folks will not tell you the truth and will not treat the wonderful people of our country with the respect that they deserve. And I hope going forward we can be a little bit different, and maybe get along a little bit better, if that's possible. Maybe it's not, and that's okay too. Unfortunately, much of the media in Washington, D.C., along with New York, Los Angeles, in particular, speaks not for the people but for the special interests and for those profiting off a very, very obviously broken system. The press has become so dishonest that if we don’t talk about it, we are doing a tremendous disservice to the American people -- tremendous disservice. We have to talk about it to find out what's going on, because the press honestly is out of control. The level of dishonesty is out of control. I ran for President to represent the citizens of our country. I am here to change the broken system so it serves their families and their communities well. I am talking, and really talking, on this very entrenched power structure, and what we're doing is we're talking about the power structure, we're talking about its entrenchment. As a result, the media is going through what they have to go through to oftentimes distort -- not all the time -- and some of the media is fantastic, I have to say; they're honest and fantastic. But much of it is not -- the distortion. And we'll talk about it, and you'll be able to ask me questions about it. But we're not going to let it happen, because I'm here again to take my message straight to the people. As you know, our administration inherited many problems across government and across the economy. To be honest, I inherited a mess -- it’s a mess -- at home and abroad. A mess. Jobs are pouring out of the country. You see what’s going on with all of the companies leaving our country, going to Mexico and other places -- low-pay, low-wages. Mass instability overseas, no matter where you look. The Middle East, a disaster. North Korea -- we’ll take care of it, folks. We're going to take care of it all. I just want to let you know I inherited a mess. Beginning on day one, our administration went to work to tackle these challenges. On foreign affairs, we've already begun enormously productive talks with many foreign leaders -- much of it you've covered -- to move forward toward stability, security, and peace in the most troubled regions of the world, which there are many. We've had great conversations with the United Kingdom -- and meetings -- Israel, Mexico, Japan, China, and Canada. Really, really productive conversations. I would say far more productive than you would understand. We've even developed a new council with Canada to promote women’s business leaders and entrepreneurs. It's very important to me, very important to my daughter Ivanka. I have directed our defense community, headed by our great general, now Secretary Mattis -- he’s over there now, working very hard -- to submit a plan for the defeat of ISIS, a group that celebrates the murder and torture of innocent people in large sections of the world. It used to be a small group, and now it’s in large sections of the world. They've spread like cancer. ISIS has spread like cancer. Another mess I inherited. And we have imposed new sanctions on the nation of Iran, who’s totally taken advantage of our previous administration. And they're the world’s top sponsor of terrorism. And we're not going to stop until that problem is properly solved. And it’s not properly solved now. It’s one of the worst agreements I’ve ever seen drawn by anybody. I’ve ordered plans to begin for the massive rebuilding of the United States military. I’ve had great support from the Senate. I’ve had great support from Congress generally. We've pursued this rebuilding in the hopes that we will never have to use this military. And I will tell you that is my -- I would be so happy if we never had to use it. But our country will never have had a military like the military we're about to build and rebuild. We have the greatest people on Earth in our military, but they don't have the right equipment. And their equipment is old. I used it, I talked about it at every stop. Depleted -- it’s depleted. It won’t be depleted for long. At home, we have begun the monumental task of returning the government back to the people on a scale not seen in many, many years. In each of these actions, I’m keeping my promises to the American people. These are campaign promises. Some people are so surprised that we're having strong borders. Well, that's what I’ve been talking about for a year and a half -- strong borders. They're so surprised -- "oh, you're having strong borders." Well, that's what I’ve been talking about to the press and to everybody else. One promise after another after years of politicians lying to you to get elected. They lie to the American people in order to get elected. Some of the things I’m doing probably aren’t popular, but they're necessary for security and for other reasons. And then coming to Washington and pursuing their own interests, which is more important to many politicians. I’m here following through on what I pledged to do. That's all I’m doing. I put it out before the American people. Got 306 Electoral College votes. I wasn’t supposed to get 222. They said there’s no way to get 222; 230 is impossible. Two hundred and seventy, which you need, that was laughable. We got 306 because people came out and voted like they've never seen before. So that's the way it goes. I guess it was the biggest Electoral College win since Ronald Reagan. In other words, the media is trying to attack our administration because they know we are following through on pledges that we made, and they're not happy about it for whatever reason. But a lot of people are happy about it. In fact, I’ll be in Melbourne, Florida, five o’clock on Saturday, and I heard -- just heard that the crowds are massive that want to be there. I turn on the TV, open the newspapers, and I see stories of chaos. Chaos! Yet, it is the exact opposite. This administration is running like a fine-tuned machine, despite the fact that I can’t get my Cabinet approved, and they’re outstanding people. Like Senator Dan Coates whose there -- one of the most respected men of the Senate -- he can’t get approved. How do you not approve him? He’s been a colleague, highly respected -- brilliant guy, great guy, everybody knows it -- but waiting for approval. So we have a wonderful group of people that’s working very hard, that’s being very much misrepresented about, and we can’t let that happen. So if the Democrats, who have -- all you have to do is look at where they are right now -- the only thing they can do is delay, because they’ve screwed things up royally, believe me. Let me list to you some of the things that we’ve done in just a short period of time. I just got here. I got here with no Cabinet. Again, each of these actions is a promise I made to the American people. So we’ll go over just some of them, and we have a lot happening next week and in the weeks coming. We’ve withdrawn from the job-killing disaster known as Trans-Pacific Partnership. We’re going to make trade deals, but we’re going to have one-on-one deals -- bilateral. We’re going to have one-on-one deals. We’ve directed the elimination of regulations that undermine manufacturing, and called for expedited approval of the permits needed for America and American infrastructure, and that means plants, equipment, roads, bridges, factories. People take 10, 15, 20 years to get disapproved for a factory. They go in for a permit -- it’s many, many years. And then at the end of the process -- they spend tens of millions of dollars on nonsense -- and at the end of the process, they get rejected. Now, they may be rejected with me, but it’s going to be a quick rejection. It's not going to take years. But mostly, it’s going to be an acceptance. We want plants built, and we want factories built, and we want the jobs. We don’t want the jobs going to other countries. We’ve imposed a hiring freeze on nonessential federal workers. We’ve imposed a temporary moratorium on new federal regulations. We’ve issued a game-changing new rule that says for each one new regulation, two old regulations must be eliminated. Makes sense. Nobody has ever seen regulations like we have. If you go to other countries and you look at industries they have, and you say, let me see your regulations, and they're a fraction, just a tiny fraction of what we have. And I want regulations because I want safety, I want all environmental situations to be taken properly care of. It’s very important to me. But you don’t need four or five or six regulations to take care of the same thing. We’ve stood up for the men and women of law enforcement, directing federal agencies to ensure they are protected from crimes of violence. We’ve directed the creation of a task force for reducing violent crime in America, including the horrendous situation -- take a look at Chicago and others -- taking place right now in our inner cities. Horrible. We’ve ordered the Department of Homeland Security and Justice to coordinate on a plan to destroy criminal cartels coming into the United States with drugs. We’re becoming a drug-infested nation. Drugs are becoming cheaper than candy bars, and we’re not going to let it happen any longer. We’ve ordered a crackdown on sanctuary cities that refuse to comply with federal law and that harbor criminal aliens, and we’ve ordered an end to the policy of catch and release on the border. No more release, no matter who you are -- release. We’ve begun a nationwide effort to remove criminal aliens, gang members, drug dealers, and others who pose a threat to public safety. We are saving American lives every single day. The court system has not made it easy for us. And we've even created a new office in Homeland Security dedicated to the forgotten American victims of illegal immigrant violence, of which there are many. We’ve taken decisive action to keep radical Islamic terrorists out of our country. Though parts of our necessary and constitutional actions were blocked by a judge’s, in my opinion, incorrect and unsafe ruling, our administration is working night and day to keep you safe -- including reporters safe -- and is vigorously defending this lawful order. I will not back down from defending our country. I got elected on defense of our country. And I keep my campaign promises. And our citizens will be very happy when they see the result. They already are. I can tell you that. Extreme vetting will be put in place, and it already is in place in many places. In fact, we had to go quicker than we thought because of the bad decision we received from a circuit that has been overturned at a record number. I've heard 80 percent -- I find that hard to believe; that's just a number I heard -- that they're overturned 80 percent of the time. I think that circuit is in chaos and that circuit is, frankly, in turmoil. But we are appealing that and we are going further. We're issuing a new executive action next week that will comprehensively protect our country, so we'll be going along the one path and hopefully winning that. At the same time, we will be issuing a new and very comprehensive order to protect our people, and that will be done some time next week, toward the beginning or middle at the latest part. We've also taken steps to begin construction of the Keystone Pipeline and Dakota Access Pipelines -- thousands and thousands of jobs -- and put new "Buy American" measures in place to require American steel for American pipelines. In other words, they build a pipeline in this country and we use the powers of government to make that pipeline happen. We want them to use American steel. And they're willing to do that, but nobody ever asked before I came along. Even this order was drawn and they didn't say that. And I'm reading the order, I'm saying, why aren't we using American steel? And they said, that's a good idea. We put it in. To drain the swamp of corruption in Washington, D.C. I've started by imposing a five-year lobbying ban on White House officials and a lifetime ban on lobbying for a foreign government. We've begun preparing to repeal and replace Obamacare. Obamacare is a disaster, folks. It's a disaster. You can say, oh, Obamacare -- I mean, they fill up our alleys with people that you wonder how they get there, but they're not the Republican people that our representatives are representing. So we've begun preparing to repeal and replace Obamacare and are deep in the midst of negotiations on a very historic tax reform to bring our jobs back. We're bringing our jobs back to this country big league. It's already happening, but big league. I've also worked to install a Cabinet over the delays and obstruction of Senate Democrats. You've seen what they've done over the last long number of years. That will be one of the great Cabinets ever assembled in American history. You look at Rex Tillerson -- he's out there negotiating right now. General Mattis I mentioned before, General Kelly. We have great, great people. Mick is with us now. We have great people. Among their responsibilities will be ending the bleeding of jobs from our country and negotiating fair trade deals for our citizens. Now, look, fair trade -- not free -- fair. If a country is taking advantage of us, we're not going to let that happen anymore. Every country takes advantage of us, almost. I may be able to find a couple that don't. But for the most part, that would be a very tough job for me to do. Jobs have already started to surge. Since my election, Ford announced it will abandon its plans to build a new factory in Mexico and will instead invest $700 million in Michigan, creating many, many jobs. Fiat-Chrysler announced it will invest $1 billion in Ohio and Michigan, creating 2,000 new American jobs. They were with me a week ago. You know -- you were here. General Motors, likewise, committed to invest billions of dollars in its American manufacturing operation, keeping many jobs here that were going to leave. And if I didn't get elected, believe me, they would have left. And these jobs and these things that I'm announcing would never have come here. Intel just announced that it will move ahead with a new plant in Arizona that probably was never going to move ahead with. And that will result in at least 10,000 American jobs. Walmart announced it will create 10,000 jobs in the United States just this year because of our various plans and initiatives. There will be many, many more. Many more. These are a few that we're naming. Other countries have been taking advantage of us for decades -- decades and decades and decades, folks. And we’re not going to let that happen anymore. Not going to let it happen. And one more thing. I have kept my promise to the American people by nominating a justice of the United States Supreme Court, Judge Neil Gorsuch, who is from my list of 20, and who will be a true defender of our laws and our Constitution -- highly respected, should get the votes from the Democrats -- you may not see that, but he’ll get there one way or the other. But he should get there the old-fashioned way, and he should get those votes. This last month has represented an unprecedented degree of action on behalf of the great citizens of our country. Again, I say it -- there has never been a presidency that’s done so much in such a short period of time. And we haven’t even started the big work that starts early next week. Some very big things are going to be announced next week. THE PRESIDENT: Mike Flynn is a fine person, and I asked for his resignation. He respectfully gave it. He is a man who -- there was a certain amount of information given to Vice President Pence, who is with us today. And I was not happy with the way that information was given. He didn’t have to do that, because what he did wasn’t wrong, what he did in terms of the information he saw. What was wrong was the way that other people, including yourselves in this room, were given that information, because that was classified information that was given illegally. That’s the real problem. And you can talk all you want about Russia, which was all a fake news, fabricated deal to try and make up for the loss of the Democrats, and the press plays right into it. In fact, I saw a couple of the people that were supposedly involved with all of this -- they know nothing about it. They weren’t in Russia, they never made a phone call to Russia, they never received a phone call. It’s all fake news. It’s all fake news. The nice thing is I see it starting to turn, where people are now looking at the illegal, Mara -- and I think it’s very important -- the illegal giving out classified information. And let me just tell you, it was given out, like, so much. I’ll give you an example. I called, as you know, Mexico. It was a very confidential, classified call, but I called Mexico. And in calling Mexico, I figured, oh, well, that’s -- I spoke to the President of Mexico, had a good call. All of a sudden it’s out for the world to see. It’s supposed to be secret. It’s supposed to be either confidential or classified in that case. Same thing with Australia. All of a sudden people are finding out exactly what took place. The same thing happened with respect to General Flynn. Everybody saw this, and I’m saying -- the first thing I thought of when I heard about it is, how does the press get this information that’s classified? How do they do it? You know why? Because it’s an illegal process, and the press should be ashamed of themselves. But, more importantly, the people that gave out the information to the press should be ashamed of themselves. Really ashamed. THE PRESIDENT: Because when I looked at the information, I said, I don’t think he did anything wrong. If anything, he did something right. He was coming into office, he looked at the information. He said, huh, that’s fine, that’s what they’re supposed to do. They’re supposed to be -- and he didn’t just call Russia. He called and spoke to, both ways -- I think there were 30-some-odd countries. He’s doing the job. Q President Trump, since you brought up Russia, I'm looking for some clarification here. During the campaign, did anyone from your team communicate with members of the Russian government or Russian intelligence? And if so, what was the nature of those conversations? THE PRESIDENT: Well, the failing New York Times wrote a big, long front-page story yesterday. And it was very much discredited, as you know. It was -- it’s a joke. And the people mentioned in the story -- I notice they were on television today saying they never even spoke to Russia. They weren’t even a part, really -- I mean, they were such a minor part -- I hadn’t spoken to them. I think the one person, I don’t think I’ve ever spoken to him. I don’t think I’ve ever met him. And he actually said he was a very low-level member of, I think, a committee for a short period of time. I don’t think I ever met him. Now, it’s possible that I walked into a room and he was sitting there, but I don’t think I ever met him. I didn’t talk to him, ever. And he thought it was a joke. The other person said he never spoke to Russia, never received a call. Look at his phone records, et cetera, et cetera. And the other person, people knew that he’d represented various countries, but I don't think he represented Russia -- but knew that he represented various countries. That's what he does. I mean, people know that. That's Mr. Manafort, who's, by the way -- who's, by the way, a respected man. He’s a respected man. But I think he represented the Ukraine, or Ukraine government, or somebody. But everybody -- people knew that. Everybody knew that. So these people -- and he said that he has absolutely nothing to do and never has with Russia. And he said that very forcefully. I saw his statement. He said it very forcefully. Most of the papers don't print it because that's not good for their stories. So the three people that they talked about all totally deny it. And I can tell you, speaking for myself, I own nothing in Russia. I have no loans in Russia. I don't have any deals in Russia. President Putin called me up very nicely to congratulate me on the win of the election. He then called me up extremely nicely to congratulate me on the inauguration, which was terrific. But so did many other leaders -- almost all other leaders from almost all other countries. So that's the extent. Russia is fake news. Russia -- this is fake news put out by the media. The real news is the fact that people, probably from the Obama administration because they're there -- because we have our new people going in place right now. As you know, Mike Pompeo is now taking control of the CIA. James Comey at FBI. Dan Coats is waiting to be approved. I mean, he is a senator, and a highly respected one. And he’s still waiting to be approved. But our new people are going in. So they took this front-page story out of The Wall Street Journal -- top -- and they just wrote the story is not true. 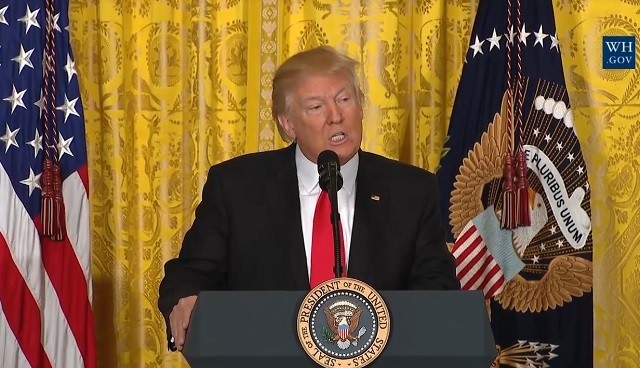 And I’ll tell you something, I’ll be honest -- because I sort of enjoy this back and forth, and I guess I have all my life, but I’ve never seen more dishonest media than, frankly, the political media. I thought the financial media was much better, much more honest. But I will say that I never get phone calls from the media. How do they write a story like that in The Wall Street Journal without asking me? Or how do they write a story in The New York Times, put it on front page? That was like that story they wrote about the women and me -- front page. Big massive story. And it was nasty. And then they called. They said, "We never said that. We like Mr. Trump." They called up my office -- we like Mr. Trump; we never said that. And it was totally -- they totally misrepresented those very wonderful women, I have to tell you -- totally misrepresented. I said, give us a retraction. They never gave us a retraction. And, frankly, I then went on to other things. THE PRESIDENT: Well, no, I was told -- I was given that information. I don't know. I was just given. We had a very, very big margin. Q I guess my question is, why should Americans trust you when you have accused the information they receive of being fake when you're providing information that's fake? THE PRESIDENT: Well, I don't know. I was given that information. I was given -- actually, I’ve seen that information around. But it was a very substantial victory. Do you agree with that? THE PRESIDENT: Okay, thank you. That's a good answer. Yes. Q Mr. President, thank you so much. Can you tell us in determining that Lieutenant General Flynn -- there was no wrongdoing in your mind, what evidence was weighed? Did you have the transcripts of these telephone intercepts with Russian officials, particularly Ambassador Kislyak, who he was communicating with? What evidence did you weigh to determine there was no wrong doing? And further than that, sir, you've said on a couple of occasions this morning that you were going to aggressively pursue the sources of these leaks. Q Can we ask what you're doing to do? And also, we've heard about a review of the intelligence community headed by Stephen Feinberg. What can you tell us about that? THE PRESIDENT: Well, first of all, about that, we now have Dan Coats, hopefully soon Mike Pompeo and James Comey, and they're in position. So I hope that we’ll be able to straighten that out without using anybody else. The gentleman you mentioned is a very talented man, very successful man. And he has offered his services, and it’s something we may take advantage of. But I don't think we’ll need that at all because of the fact that I think that we're going to be able to straighten it out very easily on its own. As far as the general is concerned, when I first heard about it, I said, huh, that doesn't sound wrong. My counsel came -- Don McGahn, White House Counsel -- and he told me, and I asked him, and he can speak very well for himself. He said he doesn't think anything is wrong. He really didn't think -- it was really what happened after that, but he didn't think anything was done wrong. I didn't either, because I waited a period of time and I started to think about it. I said, well, I don't see -- to me, he was doing the job. The information was provided by -- who I don't know -- Sally Yates -- and I was a little surprised because I said, doesn't sound like he did anything wrong there. But he did something wrong with respect to the Vice President, and I thought that was not acceptable. As far as the actual making the call -- in fact, I've watched various programs and I've read various articles where he was just doing his job. That was very normal. At first, everybody got excited because they thought he did something wrong. After they thought about it, it turned out he was just doing his job. So -- and I do -- and, by the way, with all of that being said, I do think he's a fine man. THE PRESIDENT: Go ahead, finish off, then I'll get you, Jon. THE PRESIDENT: Yes, we're looking at it very, very seriously. I've gone to all of the folks in charge of the various agencies, and we're -- I've actually called the Justice Department to look into the leaks. Those are criminal leaks. They're put out by people either in agencies. I think you'll see it stopping because now we have our people in. You know, again, we don't have our people in because we can't get them approved by the Senate. We just had Jeff Sessions approved in Justice, as an example. So we are looking into that very seriously. It's a criminal act. You know what I say -- when I was called out on Mexico, I was shocked. Because all this equipment, all this incredible phone equipment. When I was called out on Mexico, I was -- honestly, I was really, really surprised. But I said, you know, it doesn't make sense, that won't happen. But that wasn't that important to call, it was fine. I could show it to the world and he could show it to the world -- the President who is a very fine man, by the way. Same thing with Australia. I said, that's terrible that it was leaked but it wasn't that important. But then I said, what happens when I'm dealing with the problem of North Korea? What happens when I'm dealing with the problems in the Middle East? Are you folks going to be reporting all of that very, very confidential information -- very important, very -- I mean, at the highest level, are you going to be reporting about that too? So I don't want classified information getting out to the public. And in a way, that was almost a test. So I'm dealing with Mexico. I'm dealing with Argentina. We were dealing on this case with Mike Flynn. All this information gets put into the Washington Post and gets put into the New York Times. And I'm saying, what's going to happen when I'm dealing on the Middle East? What's going to happen when I'm dealing with really, really important subjects like North Korea? We've got to stop it. That's why it's a criminal penalty. THE PRESIDENT: Well, the leaks are real. You're the one that wrote about them and reported them. I mean, the leaks are real. You know what they said -- you saw it. And the leaks are absolutely real. The news is fake because so much of the news is fake. So one thing that I felt it was very important to do -- and I hope we can correct it, because there is nobody I have more respect for -- well, maybe a little bit -- than reporters, than good reporters. It's very important to me, and especially in this position. It's very important. I don't mind bad stories. I can handle a bad story better than anybody as long as it's true. And over a course of time, I'll make mistakes and you'll write badly and I'm okay with that. But I'm not okay when it is fake. I mean, I watch CNN -- it's so much anger and hatred and just the hatred. I don't watch it anymore because it's very good -- he's saying no. It's okay, Jim. It's okay, Jim. You’ll have your chance. But I watch others too. You’re not the only one, so don’t feel badly. But I think it should be straight. I think it should be -- I think it would be, frankly, more interesting. I know how good everybody’s ratings are right now, but I think that actually would be -- I think that it would actually be better. People -- I mean, you have a lower approval rate than Congress. I think that’s right. I don’t know, Peter, is that one right? Because you know, I think they have lower -- I heard, lower than Congress. But honestly, the public would appreciate it. I’d appreciate it. Again, I don’t mind bad stories when it’s true. But we have an administration where the Democrats are making it very difficult. I think we’re setting a record, or close to a record in the time of approval of a Cabinet. I mean, the numbers are crazy. When I’m looking -- some of them had them approved immediately. I’m going forever, and I still have a lot of people that we’re waiting for. And that’s all they’re doing, is delaying. And you look at Schumer and the mess that he’s got over there, and they have nothing going. The only thing they can do is delay. And you know, I think they’d be better served by approving and making sure that they’re happy and everybody is good. And sometimes, I mean -- I know President Obama lost three or four, and you lose them on the way. And that’s okay. That’s fine. Now, when WikiLeaks, which I had nothing to do with, comes out and happens to give -- they’re not giving classified information. They’re giving stuff -- what was said at an office about Hillary cheating on the debates -- which, by the way, nobody mentions. Nobody mentions that Hillary received the questions to the debates. Can you imagine -- seriously, can you imagine if I received the questions? It would be the electric chair, okay? “He should be put in the electric chair.” You would even call for the reinstitution of the death penalty, okay? Maybe not you, Jon. THE PRESIDENT: Excuse me -- no, I fired him because of what he said to Mike Pence, very simple. Mike was doing his job. He was calling countries and his counterparts. So it certainly would have been okay with me if he did it. I would have directed him to do it if I thought he wasn’t doing it. I didn’t direct him but I would have directed him because that’s his job. And it came out that way -- and, in all fairness, I watched Dr. Charles Krauthammer the other night say he was doing his job. And I agreed with him. And since then I’ve watched many other people say that. Q They're pretty good right now, actually. THE PRESIDENT: No, no, but are you -- let me do one at a time. Do you mind? But in one case you’re talking about classified. Regardless, if you look at the RNC, we had a very strong -- at my suggestion -- and I give Reince great credit for this -- at my suggestion, because I know something about this world, I said I want a very strong defensive mechanism. I don’t want to be hacked. And we did that, and you have seen that they tried to hack us and they failed. The DNC did not do that. And if they did it, they could not have been hacked. But they were hacked, and terrible things came. And the only thing that I do think is unfair is some of the things were so -- they were -- when I heard some of those things, I said -- I picked up the papers the next morning, I said, oh, this is going to front page. It wasn’t even in the papers. I mean, think of it. They gave her the questions for the debate, and she should have reported herself. Why didn’t Hillary Clinton announce that, "I’m sorry, but I have been given the questions to a debate or a town hall, and I feel that it’s inappropriate, and I want to turn in CNN for not doing a good job"? Q And if I may follow up on that, just something that Jonathan Karl was asking you about -- you said that the leaks are real, but the news is fake. I guess I don't understand. It seems that there is a disconnect there. If the information coming from those leaks is real, then how can the stories be fake? Q And if I may ask -- I just want to ask one other question. THE PRESIDENT: Jim, you know what it is? Here’s the thing. The public isn’t -- they read newspapers, they see television, they watch. They don't know if it’s true or false because they're not involved. I’m involved. I’ve been involved with this stuff all my life. But I’m involved. So I know when you're telling the truth or when you're not. I just see many, many untruthful things. And I tell you what else I see. I see tone. You know the word “tone.” The tone is such hatred. I’m really not a bad person, by the way. No, but the tone is such -- I do get good ratings, you have to admit that. The tone is such hatred. THE PRESIDENT: Well, you look at your show that goes on at 10 o’clock in the evening. You just take a look at that show. That is a constant hit. The panel is almost always exclusive anti-Trump. The good news is he doesn't have good ratings. But the panel is almost exclusive anti-Trump. And the hatred and venom coming from his mouth, the hatred coming from other people on your network. Now, I will say this. I watch it. I see it. I’m amazed by it. And I just think you’d be a lot better off -- I honestly do. The public gets it, you know. Look, when I go to rallies, they turn around, they start screaming at CNN. They want to throw their placards at CNN. Now, they’ll take this news conference. I’m actually having a very good time, okay? But they’ll take this news conference -- don't forget that's the way I won. Remember, I used to give you a news conference every time I made a speech, which was like every day. THE PRESIDENT: No, that's how I won. I won with news conferences and probably speeches. I certainly didn't win by people listening to you people, that's for sure. But I am having a good time. Tomorrow they will say, Donald Trump rants and raves at the press. I’m not ranting and raving. I’m just telling you, you're dishonest people. But -- but I’m not ranting and raving. I love this. I’m having a good time doing it. But tomorrow the headlines are going to be: Donald Trump Rants and Raves. I’m not ranting and raving. THE PRESIDENT: I looked -- you know, I looked at that name. I said, wait a minute, is there any relation there? Alex Acosta. THE PRESIDENT: No, I checked it. I said -- they said, no, sir. I said, do me a favor, go back and check the family tree. Q But aren’t you concerned, sir, that you are undermining the people's faith in the First Amendment freedom of the press, the press in this country when you call stories you don't like “fake news”? Why not just say it’s a story I don't like? Q -- in our news media. THE PRESIDENT: Okay, I understand -- and you're right about that except this. See, I know when I should get good and when I should get bad. And sometimes I’ll say, wow, that's going to be a great story, and I’ll get killed. I know what’s good and bad. I’d be a pretty good reporter -- not as good as you. But I know what’s good. I know what’s bad. And when they change it and make it really bad -- something that should be positive. Sometimes something that should be very positive, they’ll make okay. They’ll even make it negative. So I understand it because I’m there. I know what was said. I know who is saying it. I’m there. So it’s very important to me. Look, I want to see an honest press. When I started off today by saying that it’s so important to the public to get an honest press. The press -- the public doesn't believe you people anymore. Now, maybe I had something to do with that, I don't know. But they don't believe you. If you were straight and really told it like it is, as Howard Cosell used to say, right? Of course, he had some questions also. But if you were straight, I would be your biggest booster, I would be your biggest fan in the world -- including bad stories about me. But if you go -- as an example, you're CNN -- I mean, it’s story after story after story is bad. I won. I won. And the other thing: Chaos. There’s zero chaos. We are running -- this is a fine-tuned machine. And Reince happens to be doing a good job. But half of his job is putting out lies by the press. I said to him yesterday, this whole Russia scam that you guys are building so that you don't talk about the real subject, which is illegal leaks. But I watched him yesterday working so hard to try and get that story proper. And I’m saying, here’s my Chief of Staff, a really good guy, did a phenomenal job at RNC. I mean, we won the election, right? We won the presidency. We got some senators. We got some -- all over the country, you take a look, he’s done a great job. And I said to myself, you know -- and I said to somebody that was in the room -- I said, you take a look at Reince, he’s working so hard just putting out fires that are fake fires. They're fake. They're not true. And isn't that a shame, because he'd rather be working on health care. He'd rather be working on tax reform, Jim. I mean that. I would be your biggest fan in the world if you treated me right. I sort of understand there's a certain bias, maybe by Jeff or somebody -- for whatever reason. And I understand that. But you've got to be at least a little bit fair. And that's why the public sees it -- they see it. They see it's not fair. You take a look at some of your shows and you see the bias and the hatred. And the public is smart. They understand it. THE PRESIDENT: I think they don't believe it. I don't think the public would. That's why the Rasmussen poll just has me through the roof. I don't think they believe it. Well, I guess one of the reasons I'm here today is to tell you the whole Russian thing -- that's a ruse. That's a ruse. And, by the way, it would be great if we could get along with Russia, just so you understand that. Now, tomorrow you'll say, Donald Trump wants to get along with Russia, this is terrible. It's not terrible -- it's good. We had Hillary Clinton try and do a reset. We had Hillary Clinton give Russia 20 percent of the uranium in our country. You know what uranium is, right? It's this thing called nuclear weapons and other things. Like, lots of things are done with uranium, including some bad things. Nobody talks about that. I didn't do anything for Russia. I've done nothing for Russia. Hillary Clinton gave them 20 percent of our uranium. Hillary Clinton did a reset, remember, with the stupid plastic button that made us all look like a bunch of jerks? Here, take a look. He looked at her like, what the hell is she doing with that cheap plastic button? Hillary Clinton -- that was a reset. Remember? It said "reset." Now, if I do that, oh, I'm a bad guy. If we could get along with Russia, that's a positive thing. We have a very talented man, Rex Tillerson, who is going to be meeting with them shortly. And I told him, I said, I know politically it's probably not good for me. Hey, the greatest thing I could do is shoot that ship that's 30 miles offshore right out of the water. Everyone in this country is going to say, oh, it's so great. That's not great. That's not great. I would love to be able to get along with Russia. Now, you've had a lot of Presidents that haven't taken that tact. Look where we are now. Look where we are now. So, if I can -- now, I love to negotiate things. I do it really well and all that stuff, but it's possible I won't be able to get along with Putin. Maybe it is. But I want to just tell you, the false reporting by the media, by you people -- the false, horrible, fake reporting makes it much harder to make a deal with Russia. And probably Putin said, you know -- he's sitting behind his desk and he's saying, you know, I see what's going on in the United States, I follow it closely; it's got to be impossible for President Trump to ever get along with Russia because of all the pressure he's got with this fake story. Okay? And that's a shame. Because if we could get along with Russia -- and, by the way, China and Japan and everyone -- if we could get along, it would be a positive thing, not a negative thing. THE PRESIDENT: Tax reform is going to happen fairly quickly. We're doing Obamacare -- we're in final stages. We should be submitting the initial plan in March, early March, I would say. And we have to, as you know, statutorily and for reasons of budget, we have to go first. It's not like -- frankly, the tax would be easier, in my opinion, but for statutory reasons and for budgetary reasons, we have to submit the health care sooner. So we'll be submitting health care sometime in early March, mid-March. And after that, we're going to come up -- and we're doing very well on tax reform. Q Mr. President, you mentioned Russia. Let's talk about some serious issues that have come up in the last week that you have had to deal with as President of the United States. Q -- of the agreement between the two countries. And a Russian plane buzzed a U.S. destroyer. Q I'm just trying to find out what you're doing to do about them, Mr. President. THE PRESIDENT: All of those things that you mentioned are very recent, because probably Putin assumes that he's not going to be able to make a deal with me because it's politically not popular for me to make a deal. So Hillary Clinton tries to reset, it failed. They all tried. But I'm different than those people. THE PRESIDENT: I have. I have. And I'm so beautifully represented. I'm so honored that the Senate approved him. He's going to be fantastic. THE PRESIDENT: No, I don't think so. I think Putin probably assumes that he can't make a deal with me anymore because politically it would be unpopular for a politician to make a deal. I can't believe I'm saying I'm a politician, but I guess that's what I am now. Because, look, it would be much easier for me to be tough on Russia, but then we're not going to make a deal. Now, I don't know that we're going to make a deal. I don't know. We might, we might not. But it would be much easier for me to be so tough -- the tougher I am on Russia, the better. But you know what, I want to do the right thing for the American people. And to be honest, secondarily, I want to do the right thing for the world. If Russia and the United States actually got together and got along -- and don't forget, we're a very powerful nuclear country and so are they. There's no upside. We're a very powerful nuclear country and so are they. I've been briefed. And I can tell you, one thing about a briefing that we're allowed to say because anybody that ever read the most basic book can say it: Nuclear holocaust would be like no other. They're a very powerful nuclear country and so are we. If we have a good relationship with Russia, believe me, that's a good thing, not a bad thing. Q No, when I read off the three things that have recently happened and each one of them you said they're not good. THE PRESIDENT: No, it's not good, but they happened. But I tell you one thing: She tried to make a deal. She had the reset. She gave all the valuable uranium away. She did other things. You know, they say I’m close to Russia. Hillary Clinton gave away 20 percent of the uranium in the United States. She’s close to Russia. I gave -- you know what I gave to Russia? You know what I gave? Nothing. Q There will be a -- in other words, there will be a response, Mr. President? THE PRESIDENT: I don’t have to tell you what I’m going to do in North Korea. Wait a minute. I don’t have to tell you what I’m going to do in North Korea. And I don’t have to tell you what I’m going to do with Iran. You know why? Because they shouldn’t know. And eventually you guys are going to get tired of asking that question. So when you ask me, what am I going to do with the ship -- the Russian ship, as an example -- I’m not going to tell you. But hopefully, I won’t have to do anything. But I’m not going to tell you. Okay. THE PRESIDENT: Wait, wait, wait. I know who you are. Just wait. Let me tell you about the travel ban. We had a very smooth rollout of the travel ban, but we had a bad court. We got a bad decision. We had a court that’s been overturned -- again, maybe wrong, but I think it’s 80 percent of the time. A lot. We had a bad decision. We’re going to keep going with that decision. We’re going to put in a new executive order next week sometime. But we had a bad decision. That’s the only thing that was wrong with the travel ban. Now, what I wanted to do was do the exact same executive order but said one thing -- and I said this to my people: Give them a one-month period of time. But General Kelly, now Secretary Kelly, said, if you do that, all these people will come in, in the month -- the bad ones. You do agree, there are bad people out there, right? They’re not everybody that’s like you. You have some bad people out there. THE PRESIDENT: Russia is a ruse. Yeah, I know you have to get up and ask a question, so important. Russia is a ruse. I have nothing to do with Russia, haven’t made a phone call to Russia in years. Don’t speak to people from Russia. Not that I wouldn’t, I just have nobody to speak to. I spoke to Putin twice. He called me on the election -- I told you this -- and he called me on the inauguration, and a few days ago. We had a very good talk, especially the second one -- lasted for a pretty long period of time. I’m sure you probably get it because it was classified, so I’m sure everybody in this room perhaps has it. But we had a very, very good talk. I have nothing to do with Russia. To the best of my knowledge, no person that I deal with does. Now, Manafort has totally denied it. He denied it. Now, people knew that he was a consultant over in that part of the world for a while, but not for Russia. I think he represented Ukraine or people having to do with Ukraine, or people that -- whoever. But people knew that. Everybody knew that. THE PRESIDENT: I have -- you know what, he said no. I can only tell you what he -- now, he was replaced long before the election. You know that, right? He was replaced long before the election. When all of this stuff started coming out, it came out during the election. But Paul Manafort, who’s a good man also, by the way -- Paul Manafort was replaced long before the election took place. He was only there for a short period of time. THE PRESIDENT: Wait, let’s see, who’s -- I want to find a friendly reporter. Are you a friendly reporter? Watch how friendly he is. Wait, wait -- watch how friendly he is. Go ahead. Go ahead. Q So, first of all, my name is (inaudible) from (inaudible) Magazine. And (inaudible). I haven’t seen anybody in my community accuse either yourself or any of the -- anyone on your staff of being anti-Semitic. We have an understanding of (inaudible). So here’s the story, folks. Number one, I am the least anti-Semitic person that you’ve ever seen in your entire life. Number two, racism -- the least racist person. In fact, we did very well relative to other people running as a Republican. THE PRESIDENT: Quiet, quiet, quiet. See, he lied about -- he was going to get up and ask a very straight, simple question. So you know, welcome to the world of the media. But let me just tell you something -- that I hate the charge. I find it repulsive. I hate even the question because people that know me -- and you heard the Prime Minister, you heard Netanyahu yesterday -- did you hear him, Bibi? He said, I’ve known Donald Trump for a long time, and then he said, forget it. THE PRESIDENT: We’re going to show great heart. DACA is a very, very difficult subject for me, I will tell you. To me, it’s one of the most difficult subjects I have, because you have these incredible kids, in many cases -- not in all cases. In some of the cases they’re having DACA and they’re gang members and they’re drug dealers too. But you have some absolutely incredible kids -- I would say mostly -- they were brought here in such a way -- it's a very, very tough subject. We are going to deal with DACA with heart. I have to deal with a lot of politicians, don't forget, and I have to convince them that what I'm saying is right. And I appreciate your understanding on that. But the DACA situation is a very, very -- it's a very difficult thing for me. Because, you know, I love these kids. I love kids. I have kids and grandkids. And I find it very, very hard doing what the law says exactly to do. And you know, the law is rough. I'm not talking about new laws. I'm talking the existing law is very rough. It's very, very rough. As far as the new order, the new order is going to be very much tailored to what I consider to be a very bad decision, but we can tailor the order to that decision and get just about everything, in some ways more. But we're tailoring it now to the decision. We have some of the best lawyers in the country working on it. And the new executive order is being tailored to the decision we got down from the court. Okay? THE PRESIDENT: Now, that's what I call a nice question. That is very nice. Who are you with? THE PRESIDENT: Good. I'm going to start watching. Thank you very much. Melania is terrific. She was here last night. We had dinner with Senator Rubio and his wife, who is, by the way, lovely. And we had a really good discussion about Cuba because we have very similar views on Cuba. And Cuba was very good to me in the Florida election as you know, the Cuban people, Americans. And I think that Melania is going to be outstanding. That's right, she just opened up the Visitors Center -- in other words, touring of the White House. She, like others that she's working with, feels very, very strongly about women's issues, women's difficulties, very, very strongly. And she's a very, very strong advocate. I think she's a great representative for this country. And a funny thing happens because she gets so unfairly maligned. The things they say -- I've known her for a long time. She was a very successful person. She was a very successful model. She did really well. She would go home at night and didn't even want to go out with people. She was a very private person. She was always the highest quality that you'll ever find. And the things they say -- and I've known her for a long time -- the things they say are so unfair. And actually, she's been apologized to, as you know, by various media because they said things that were lies. I'd just tell you this: I think she's going to be a fantastic First Lady. She's going to be a tremendous representative of women and of the people. And helping her and working with her will be Ivanka, who is a fabulous person and a fabulous, fabulous woman. And they're not doing this for money. They're not doing this for pay. They're doing this because they feel it, both of them. And Melania goes back and forth, and after Barron finishes school -- because it's hard to take a child out of school with a few months left -- she and Barron will be moving over to the White House. Thank you. That's a very nice question. THE PRESIDENT: Yes. Oh, this is going to be a bad question but that's okay. Q No, it's not going to be a bad question. Q Well, thank you so much. Mr. President, I need to find out from you -- you said something as it relates to inner cities. That was one of your platforms during your campaign. Q Fixing the inner cities. What will be that fix and your urban agenda, as well as your HBCU executive order that's coming out this afternoon? See, it wasn't bad, was it? THE PRESIDENT: We'll be announcing the order in a little while, and I'd rather let the order speak for itself. But it will be something I think that will be very good for everybody concerned. But we'll talk to you about that after we do the announcement. As far as the inner cities, as you know, I was very strong on the inner cities during the campaign. I think it's probably what got me a much higher percentage of the African American vote than a lot of people thought I was going to get. We did much higher than people thought I was going to get and I was honored by that, including the Hispanic vote, which was also much higher. And, by the way, if I might add, including the women's vote, which was much higher than people thought I was going to get. So we are going to be working very hard on the inner cities having to do with education, having to do with crime. We're going to try and fix as quickly as possible -- you know it takes a long time. It's taken 100 years or more for some of these places to evolve, and they evolved many of them very badly. But we’re going to be working very hard on health and health care; very, very hard on education. And also, we’re going to working in a stringent way, and a very good way, on crime. You go to some of these inner city places, and it’s so sad when you look at the crime. You have people -- and I’ve seen this, and I’ve sort of witnessed it. In fact, in two cases, I have actually witnessed it. They lock themselves into apartments, petrified to even leave, in the middle of the day. They’re living in hell. We can’t let that happen. So we’re going to be very, very strong. It’s a great question, and it’s a very difficult situation, because it’s been many, many years. It’s been festering for many, many years. But we have places in this country that we have to fix. We have to help African American people that, for the most part are stuck there -- Hispanic American people. We have Hispanic American people that are in the inner cities, and they’re living in hell. THE PRESIDENT: Let’s go set up a meeting. I would love to meet with the Black Caucus. I think it’s great -- the Congressional Black Caucus. I think it’s great. I actually thought I had a meeting with Congressman Cummings, and he was all excited, and then he said, oh, I can’t move, it might be bad for me politically, I can’t have that meeting. I was all set to have the meeting. You know, we called him and called him, and he was all set. I spoke to him on the phone. Very nice guy. THE PRESIDENT: He wanted it. But we called, called, called, called -- they can’t make a meeting with him. Every day, I walked in, I said, I would like to meet with him. Because I do want to solve the problem. But he probably was told by Schumer or somebody like that -- some other lightweight -- he was probably told -- he was probably told, don’t meet with Trump, it’s bad politics. And that’s part of the problem of this country. THE PRESIDENT: And some of it -- and can I be honest with you? And this has to do with racism and horrible things that are put up. Some of it written by our opponents. You do know that. Do you understand that? You don’t think anybody would do a thing like that. Some of the signs you’ll see are not put up by the people that love or like Donald Trump, they’re put up by the other side, and you think it’s like playing it straight. No. But you have some of those signs, and some of that anger is caused by the other side. They’ll do signs and they’ll do drawings that are inappropriate. It won’t be my people. It will be the people on the other side to anger people like you. Okay. We’re going to work on it very hard. One of the questions that was asked -- I thought it was a very good question -- was about the inner cities. I mean, that’s part of it. But we’re going to work on education. We’re going to work on lack -- you know, we’re going to stop -- we’re going to try and stop the crime. We have great law enforcement officials. We’re going to try and stop crime. We’re not going to try and stop, we’re going to stop crime. But it’s very important to me. But this isn’t Donald Trump that divided a nation. We went eight years with President Obama, and we went many years before President Obama. We lived in a divided nation. And I am going to try -- I will do everything within my power to fix that.